I’ve been recommending bee pollen for quite some time now as a remedy to help quell sugar cravings—but it has nutritional benefits that far exceed taming a sweet tooth. Bee pollen is the complete source of nutrition for a bee and is also the most complete food known to man, containing vitamins A, C, D, E, the B complex vitamins including folic acid, 25 minerals, and all of the essential amino acids. In fact, it is a richer source of protein than any animal source. 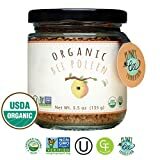 It is credited with helping everything from athletic performance and the immune system to treating skin inflammation, but the two most common reasons people consume bee pollen is to alleviate seasonal allergies and to use as a nutritional supplement. But bee pollen isn’t a quick fix food. You need to take about one teaspoon per day for three months to see any noticeable benefits. Also, it is highly recommended that you consume bee pollen that has been harvested from a source that is local to where you live, since the bees are gathering pollen from the same regional plants that may be causing seasonal allergies. Bee pollen contains many key nutrients to help your brain and your blood sugar levels, most notably it contains the complex of B-vitamins and amino acids. A key amino acid needed to help with sugar cravings is the brain-feeding nutrient L-glutamine. This important amino acid converts to glutamic acid, the only source of glucose besides sugar that the brain can use for energy. Bee pollen has worked wonders for many of my clients with sugar withdrawal. One of the benefits bee pollen is well known for is that it acts very effectively as a natural energizer for your body. It also allows you to think more clearly, and feel more positive and focused. For this reason, I often recommend it to college students who are studying for exams. It also helps you sleep better and feel more at peace and relaxed. Bee pollen benefits also extend to the area of weight loss. It has an ability to help in fat loss by rectifying a chemical imbalance that many people with weight problems tend to have. Other weight control benefits of bee pollen include improving your metabolism (the rate at which your body burns fat); dissolving and flushing fat cells from your body due to the high percentage of lecithin contained in bee pollen; and it also helps to reduce your cravings for food. 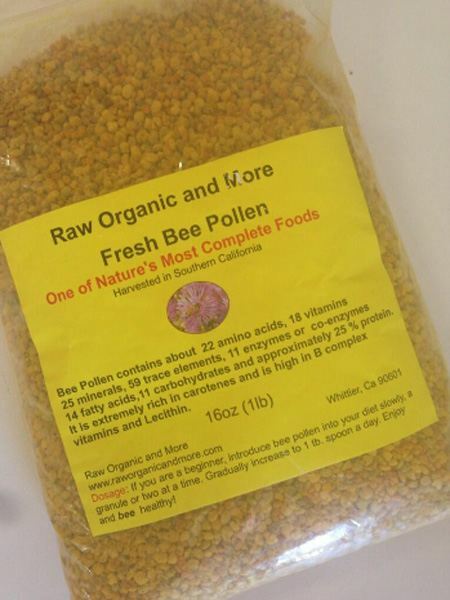 Because of the lecithin content, bee pollen is also very effective in lowering your cholesterol levels. While there are many bee pollen benefits the only side effect is for those who are allergic to bee stings. If you are allergic to bee stings it would be best to avoid bee pollen. Since it is such a richly packed nutritional food, it is advisable to introduce it to your diet slowly and to make sure you don’t have an allergic reaction. It is wonderful to add to smoothies, salads, yogurt, and many other foods, but do not add it to anything hot since heat will destroy the active enzymes and reduce the nutritional benefits. Bee pollen can be stored for about six months, and it can be frozen safely for later use. Bee pollen is packed with live enzymes, vitamins, minerals phytonutrients, plus some elements that science has not yet identified. Your digestion may not be accustomed to such an intense food. If you’re a beginner, introduce this food into your diet slowly, a granule or two at a time. Don’t expose bee pollen granules to heat. This will destroy live enzymes and reduce nutrient value. Always store in a refrigerator. Before taking a full dose of pollen, it is important to test for a possible extreme allergic reaction by ingesting just one pellet. Then build up gradually over the following weeks (see below). An optimal dose of pollen is about one teapoon several times per day. You will need to work yourself up to this amount! If you’re new to taking this super food, it is suggested you follow these guidelines to determine your sensitivity to it. Although bee pollen is not harmful, it is possible you could be sensitive to it so it’s best that you’re cautious the first time you take it. 1) Place one raw bee pollen kernel under your tongue. 2) Let it dissolve completely. It will rapidly absorb sublingually through your mucous membrane directly into your blood stream. 3) If you experience no reaction, place two granules under your tongue. 4) Continue increasing the number of granules under your tongue until you feel confident that you will not experience an allergic reaction. If you are not allergic to bees, you may still be sensitive to bee pollen. ·Signs and symptoms of a sensitivity include an itchy throat, runny nose, headache, sweating, tearing of eyes or other allergic symptoms. There are some experts who feel that with continued exposure, you’ll develop a tolerance or re-balancing of your immune system and over time you will be able to tolerate bee pollen very well. Some people find that if they start with very small doses and increase gradually, the symptoms go away. As always, check with your doctor first. Bee pollen is not safe for pregnant women. A woman should also avoid using bee pollen if she is breastfeeding. Bee pollen may cause increased bleeding if taken with certain blood thinners like warfarin. Check with your doctor before taking bee pollen if you take any medications, over-the-counter medicines, or herbals. Thanksgiving Edition – Pumpkin Pie Makeover and More!